Greetings, Opera Carolina customers. Opera Lively is proud to partner with this excellent company, and appreciative of Maestro James Meena's and Mr. Brandon Stanley's support. Puccini's great opera Tosca has been scheduled by our partners to be shown in Charlotte, NC, at the Blumenthal Center, on October 13, 18, and 21, 2012, with Jill Gardner in the title role. Read the full announcement and ticket information [here] - individual tickets are already on sale. Opera Lively has put together a series of seven articles on this opera, for those among you who want to learn a bit more about it. They are part of what we call our "Opera In-Depth" series. They really go deep, much more than what you usually find online, but they are accessible and fun to read. On the top right of this page you see a "widget" (a box with links) - depending on how you got to this page, it may or may not be already open, displaying the titles of the articles - if it's open, just click on the link to each Tosca article to have access to the full text. If the widget is not open, click on the + sign next to Exclusive Articles (attention, there's also an Exclusive Interviews link; you want the Exclusive Articles), then on the + sign next to Opera In-Depth Project, then on the + sign next to Tosca, and you'll find the links to the articles. The two Discography articles (audio and video) are under the same header. Again, depending on how you got to this page, you may find previews of the Tosca articles by just scrolling down from this text. In this case, just click on the "read more" link after each preview, to have access to that article's full text. If you don't see previews below this page, then you have to use the widget as above. Interviews with the artists - and then a review of the show - will appear later on this space; stay tuned. Maestro James Meena's interview is up already, scroll down for it. Jill Gardner will be Tosca; Raúl Melo will be Cavaradossi, and Todd Thomas will be Scarpia. 1. Tosca: The Genesis of the Opera - it talks about circumstances of composition, how the idea came to Puccini, how he got the rights to the stage play, etc. 2. Tosca: Around the Opera - this article talks about trivia and curious facts around the opera such as reactions of the public on opening night, funny anecdotes, and many other interesting facts about this opera that you're not likely to find elsewhere. 3. Tosca: Synopsis and Musical Structure - you probably know already the synopsis for Tosca (ours is very detailed) - but the second part of the article with the musical structure is quite interesting to enhance the appreciation of the show, preparing the public to pay attention to some musical details during the performance. Don't miss this article! 4.Tosca: The Characters and Their Voices - this article talks about the main singers who have tackled the tree main roles in the past and present - Tosca, Cavaradossi, and Scarpia - and contains video clips! 5. 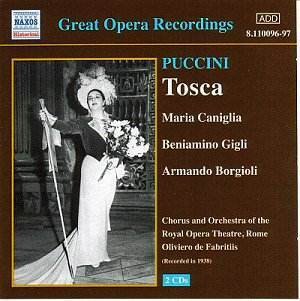 Tosca: Discography (audio) - this article is still growing, and contains reviews of Tosca CDs, as well as a complete list of the 250+ Tosca recordings. Come back periodically to it and you'll find more reviews. 6. Tosca: Discography (video) - again, it is still growing as we add reviews, and is for versions of Tosca on DVD and blu-ray discs. 7. Tosca: The Opera in the opera house - it contains comments on notable past and present stagings of this opera (also, more reviews will be added as they become available). Support your local opera company! Opera Carolina brings to Charlotte world-class, first-rate performances and is not a touring company - its shows are done 90-95% locally; opera is expensive to produce (especially at Opera Carolina's exquisite level of quality), and the company needs and deserves your help and continuous support. Sometimes, an operatic masterpiece is based on a literary or theatrical masterpiece. We will start the In-Depth articles on Tosca with a similar brief historical review than for Traviata, commenting on the main singers performing Tosca since the premiere of the opera, until our days. The first Tosca of them all was the Romanian soprano Hariclea Darclée. As part of our coverage of our partners Opera Carolina's upcoming production of Puccini's Tosca, Opera Lively has interviewed maestro James Meena about the piece (we do touch a bit on other subjects at the end of the interview). This is our second talk with Maestro Meena - you can read his first interview with us [here]. The full announcement for Opera Carolina's show (including ticket information) can be found [here]. Navigation help for all our educational articles on Tosca filled with interesting facts can be found [here]. The shows are scheduled for October 13, 18, and 21 in Charlotte, NC. Opera Carollina productions are 90% locally-made and are always first class, so this is not to be missed! Support your local opera company; there is nothing like live opera. 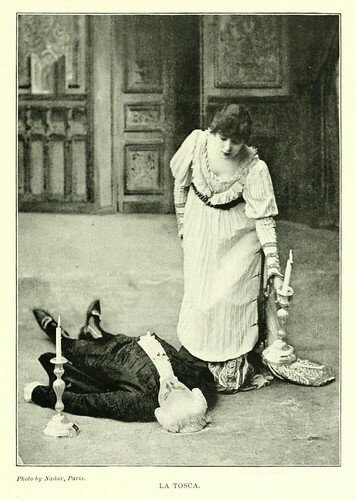 Tosca, lyric opera in three acts, music by Giacomo Puccini, libretto by Luigi Illica and Giuseppe Giacosa after Sardou's play La Tosca, premiered at the Teatro Costanzi, Rome, on January 14, 1900. Opera Carolina, Blumenthal Performing Arts Center (Belk Theater), Charlotte, NC, on October 13, 18, and 21, 2012. Click [here] for the full announcement and tickets. 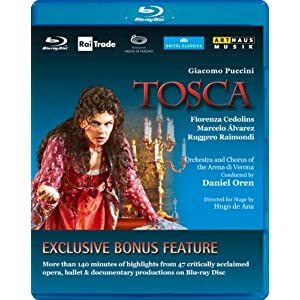 Also please consult our Tosca section [here], with many interesting articles analyzing the opera in-depth, including musical structure, trivia, discography, and interviews with Maestro Meena and the three principals.